There's a great brand of more natural products on the market sold Carol's Daughter. It is easy to find all over the US now at Sephora, as well as on HSN. I have tried several items, and adore their Almond Cookie scent. It's delicious-smelling! The lip butters are great, too, and I have talked about them before right here on Chic & Green. 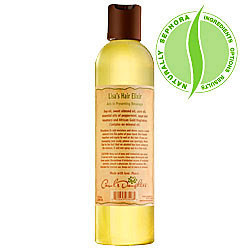 One of the best selling items in the line is called Lisa's Hair Elixir. It is a hair treatment oil sold in an 8 ounce bottle for $19. It's made for dry or brittle hair and can be used to give a nice sheen or to protect hair prior to heat styling. One of my friends adores this treatment and asked if I could give her a recipe to make something similar at a more affordable price. This is an incredibly easy recipe to make, so I thought we'd do it this week for DIY Thursday. Now, I have everything right here to make this, with the exception of the Carol's Daughter fragrance blend of African Gold. That is OK--my allergies are horrendous right now and we'll stick with just the essential oils. I made this for my friend a week or so ago and asked her to compare my recipe to the bottle of Lisa's Hair Elixir. She used it and told me that the effect is identical in her hair. She has relaxed, African-American hair and experiences occasional dryness and breakage. She said the only notable difference is the scent isn't as spicy because there are no added fragrance oils. She said she will make this at home for herself. I gently stirred together and poured into an 8 ounce bottle. This one isn't as heavy as the previous recipe. I have hair that falls a couple inches below my chin. I apply a PEA-SIZED amount of oil to my hands and rub. I then gently apply to my hair and spend 5 minutes massaging into my scalp to stimulate it. This will add shine and stimulate the hair follicles. Leave in overnight and shampoo out. I recommend once weekly treatments so hair doesn't get weighed down. By the way, there is anecdotal evidence that Castor Oil can help grow the hair after experiencing hair loss. I personally use (and I know a few of my readers do, too) Castor Oil nightly on my eyelashes to keep them healthy and shiny. Next week, we're going to make another hair treatment and will be using some more of our big block of beeswax--a hair pomade. I'm toying with returning to my pixie cut and if I don't chicken out, I'll be using some of my homemade pomade with it soon!